I’m in Lucerne for the weekend to watch a World Cup rowing regatta. So so nice. So many friends and familiar faces – the last time I was here was in 2004 – but Lucerne is like mecca to a rower. There is something very special about racing here… it is like our Wimbledon. On the way to the Rotsee where the regatta takes place is one of my fav places on earth. There is a monument – the Lion Monument that is a memorial to the Swiss guard who stood to protect the French king that they’d been hired- and swore to protect. (Louis XIV of the Marie Antoinette – Let them eat Cake fame… ) Of course the mobs overwhelmed and killed the Swiss Guard. 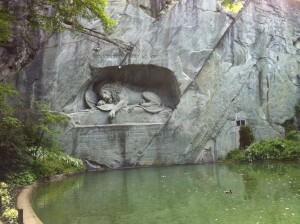 The monument is carved into an impressive stone wall – a cliff almost and shows a Lion who has been mortally wounded in combat. He is dying a valiant and brave death. Part of me always thought that high performance sport, and I guess specifically rowing, is like that. Before the race you know that you will need to throw yourself onto the sword. We choose to go into a battle that will feel like it’s killing us – and yet we do it anyway. In it’s peaceful way, it is brave and valiant. I used to stop here on my way to races that I was nervous about and somehow it made me feel brave and valiant too.